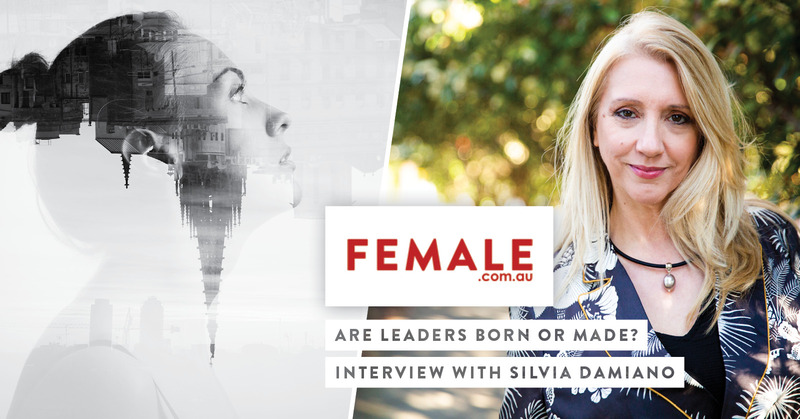 Female.com.au: Are Leaders Born Or Made? For some, leadership seems to come naturally, whereas for many others, leadership seems unattainable and daunting. According to Deloitte Trends Report, 56% of companies believe that they are not ready to meet their leadership needs in the future. With this in mind, as the balance of power in the workforce shifts from baby boomers to younger generations, the question of whether leaders are born or made is one that is worth re-examining. Social scientist, leadership expert and award-winning filmmaker, Silvia Damiano, believes that anyone can be a leader with the correct training. Over the past two decades she has developed a career on this belief and revolutionised the way organisations and individuals think about leadership. Silvia has created and directed an award-winning documentary, , with her research. 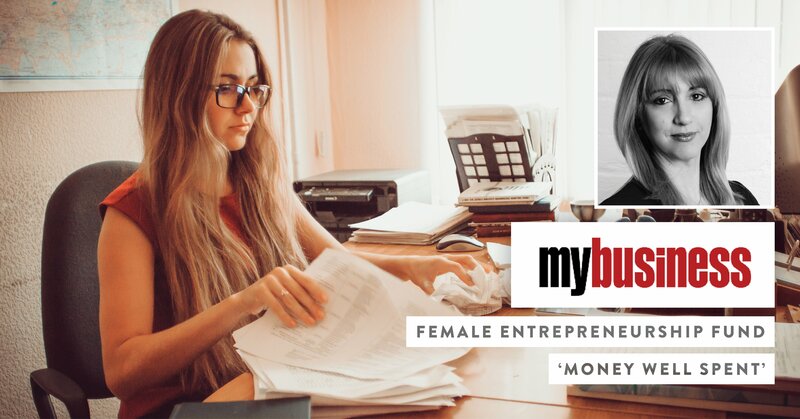 Since founding the About my Brain Institute in 2009, an organisation using neuroscience to develop leaders, teams and cultures, Silvia has worked with companies such as Microsoft, Australian Stock Exchange and VISA. She has authored a number of books including ‘ ’, and recently released her award-winning documentary ‘Make Me A Leader’. Silvia's expertise is developing the human behind the leader. The brain is, after all, just another organ, and it can adapt to create new abilities. A study conducted at Arizona State University showed that leaders that had been rated as "inspirational" by their peers had higher levels of connection in the right frontal lobe – the area of the brain that has to do with social skills and how individuals interact with one another. Both upbringing and genetics can result in differing levels of coherence in this area, but this can be adjusted during adulthood. 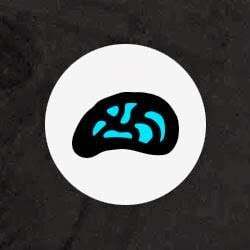 Using techniques such as neurofeedback training, the brain can be trained to respond to the ways different individuals respond to stimuli such as stress or anxiety in a productive way. Another important aspect of modern leadership that Silvia focuses on is the democratisation of leadership within an organisation. As the demands of CEO's and entrepreneurs rise, the amount of work that is expected of them begins to outstrip the physical capabilities of both the brain and body that sustains it. Even those that seem to be 'made' for leadership have their limits and are unable to continue to be productive without the proper support networks. “So much of what we think about as the archetypal leader is not suited for modern companies and organisations. We tend to place more and more of the work and expectation on the person at the very top, instead of equipping everyone with the necessary tools and practices required to lead. This inhibits the creation of ideas that are essential to success. We need to move past the leadership styles of the industrial and information age into what Silvia calls the ‘Neuroleader’ of the Imagination age – someone focused on creating and implementing new ideas through collaboration and is also well aware about how to optimise brain function”. These are all themes that are explored in the award-winning documentary produced by the About my Brain Institute, ‘ ’. Released earlier this year, the documentary uses a scientific foundation to argue that modern leadership requires an integrative approach with both the body and mind and concludes that leaders can be made. In fact, it goes even further to argue that more people should be made into leaders to deal with the current problems that face society. Through interviews with experts and leaders around the world, the documentary explores how a democratic, collaborative view of leadership is the only way for individuals to reach their true potential in a world where creativity is king. This theory is also at the heart of the i4 Live Retreat, run by the About My Brain Institute in November. Held in In Byron Bay, the retreat will see a variety of leaders, consultants, coaches and professionals explore the capabilities of the brain over a 3-day period. The program combines neuroscience, mind-brain development, neurogastronterology and good old-fashioned relaxation to explore what it is that makes each individual tick. It is open to individual's family members and friends, who can also benefit from learning from these experiences. With all the uncertainty and political instability occurring around the world, the question of what makes a good leader has never been more important. An effective leader can bring out the best in people, drive action and inspire change. They bring people together, coordinating them to work towards a common goal. Without effective leadership, organisations would fall apart. Throughout history, there have been many times where people haven't thought of themselves as leaders but still stepped up to the challenge in times of great need. As we head from the information age to the era of imagination, ensuring that every individual is given tools for leadership will become vital. Question: Do you believe leaders are born or made? Silvia Damiano: The answer is that both statements are true. Some people are born with a brain that makes them more tuned into paying attention to people around them and they have interpersonal abilities to influence them. On the other hand, we all have the capacity (and possibly the need) to learn how to influence and build better connections with others. Question: Can you explain why you believe this? Silvia Damiano: As explained above, this is not a matter of belief. We now have information about the brain which we didn't have before that indicates that leaders who are admired, inspirational and respected have different electrical patterns in their brain to the average person who doesn't display those abilities. Learning more about our brains and how this impacts on our effectiveness as a leader is the challenge we all face in the 21st Century. Silvia Damiano: First of all it is important to cultivate introspection, this means bringing our attention inwards, rather than being distracted by social media, technology, etc. When we reflect about what we do and how we act around people we realise what changes need to made in order to adjust our behaviours. Secondly we need to learn how to become comfortable in seeking and receiving feedback from others. Without feedback, we cannot challenge the biases that our brain has. This is a very subjective organ and the world is not necessarily like we see it. There are always multiple perspectives. Basically, introspection and feedback are the first critical steps to becoming a leader. Question: What types of training would you suggest? 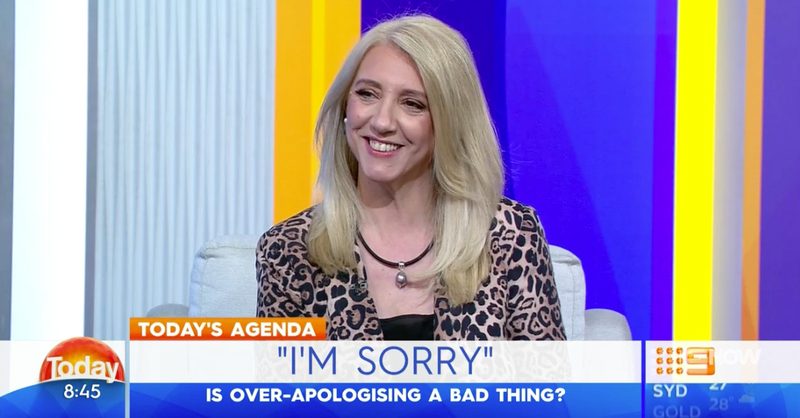 Silvia Damiano: We have an online program and also a few face -to-face programs, including our upcoming retreat which are designed to help anyone improve or enhance their personal leadership. This includes understanding how to develop the mind and the brain and optimising our performance and wellbeing. Leadership is not possible if we do not understand how to take care of ourselves first. Question: Can you tell us about Make Me A Leader documentary? Silvia Damiano: This documentary is designed to teach people around the world to become better leaders. It contains five leadership stories and seven strategies for well-being and performance. Anyone who watches can get a good idea of how to improve their leadership capacities. It is emotional, fact-based and contains a lot of story-telling. We travelled around the world over a period of 2 years to produce this documentary, trying to identify the latest research and thinking from experts across the globe. Question: Where can we watch the Make Me A Leader documentary? Question: What do you hope to achieve from Make Me A Leader? Silvia Damiano: I am hoping to leave a legacy for people who otherwise would never have access to this knowledge. I have been in this field for 20 years and in many of the programs I have ran, the participants said to me: "I wish my husband, my wife or my children would be able to understand all this content". This has been a great motivator for me to do this work. Question: What inspired you to begin the About my Brain Institute? Silvia Damiano: In the same way, that I was motivated to produce the documentary, I created the About my Brain Institute to offer a platform of learning and knowledge to democratise leadership and neuroscience. We all need to improve how our brains function, not just for leadership but to live better lives. It is all interconnected and society needs to focus more on how to make people happier and healthier rather than focusing on the negatives and what doesn't work. Living like this is not inspiring, nor helpful. Question: What do you do to stay productive, throughout the day? Silvia Damiano: I make sure I sleep well (7 - 8 hours per night), I do intermittent fasting (eat between 11 am to 7 pm) twice or three times a week. I go for a walk most mornings. I meditate and practise deep breathing. The key things for me are to maintain good blood flow in my body, manage inflammation and ensure my autonomic nervous system (sympathetic and parasympathetic are working in tune). 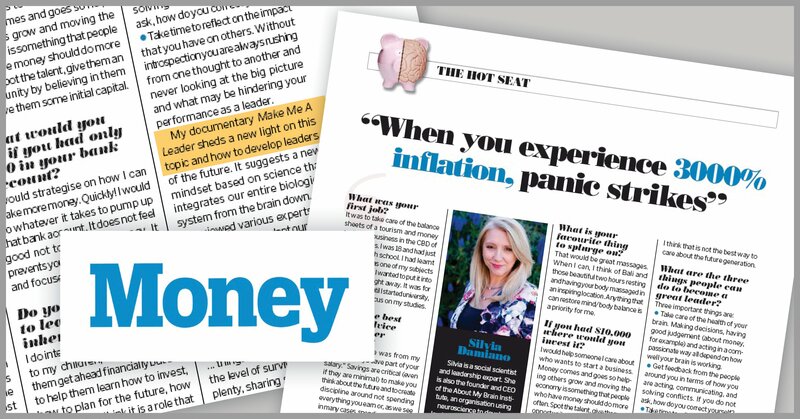 Money Magazine: When You Experience 3000% Inflation, Panic Strikes!